Thelma Mae Combs Bryant gained her angel wings Thursday, April 11th. Mrs. Bryant was born in Carroll County on November 22, 1936 to James Arthur and Nettie Combs. She held many jobs and roles in life, including wife, mother, grandmother, a retired textile mill worker, CNA, and friend to so many. 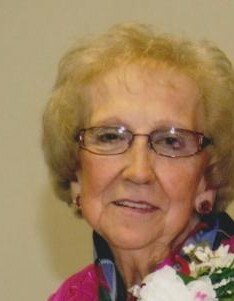 She was a faithful Christian and member of Fancy Gap Baptist Church in Mt Airy. She leaves to cherish her memory her husband of 63 years, Carlos Bryant, of the home; her children, a son, Danny Bryant and daughter, Sherry Bryant, both of Mount Airy; grandchildren, Erica Hill (Myra Tucker), of Mount Airy, Jonathan (Amanda) Bryant, of Westfield and Justin Coleman of Salisbury; great grandchildren, Mason Jester, Taylor Jester, Madison Hill, Addie Bryant, Adreana Bryant, Little Jonathan Bryant & Avery Bryant; a special friend and caregiver Marisa Hensley; brothers, Dallas Rudolph Combs of Woodlawn, VA, Lones (Helen) Combs of Fancy Gap, VA, Larry (Sandra) Combs of Cana, VA; sister, Sadie Schaeffer of Galax, VA; brother in law, Wayne Parish of Winston-Salem, NC, and sister-in-law Norma Combs Hale. In addition to her parents, Mrs. Bryant was preceded in death by a brother, James Urles Combs and a sister Wanda Parish. Funeral services will be held at 11:00, Monday April 15, 2019, at Fancy Gap Baptist Church by Rev. Dwight Sechrist and Rev. Rusty Reed. Burial will follow in Skyline Memory Gardens. The family will receive friends Sunday night from 6:00 to 8:00 at Moody Funeral Home.